May is the #MonthofMom and I’m sure you’ve been seeing lots of Mother’s day gift ideas, recipes and crafts on your favourite blogs. Today I wanted to share with you some P&G products that you can pick up to make a nice Mother’s Day pampering gift pack! Pantene Repair & Protect Collection: This set repairs and protects 6 months of damage in just one use! I can’t wait to try this. My hair has suffered from the long winter. It includes Repair & Protect Shampoo, Conditioner, 2 in 1 Shampoo + Conditioner and Overnight Miracle Repair Serum. Pantene Pro-V Stylers Collection: This is Pantene’s very first collection inspired by Celebrity Hair Stylist and Global Ambassador Danilo. It includes two hairsprays, a mousse, gel, styling balm and sculpting wax with each formula having different benefits like flexible hold, manageability, protection, etc. Natural Instincts by Clairol: This hair colour product contains antioxidants and vitamins and is the first hair colour brand that is clinically proven to be less damaging than the leading brands. Get natural looking hair colour that works in just 10 minutes and lasts through 28 shampoos. Febreze Candles: Each candle has an odour eliminating core to bring lasting freshness to your home. I have a few and use them in my kitchen to get rid of unpleasant food smells, but they would also be nice to set the mood for a relaxing bath. They have a wide range of fragrances to choose from. I have the Gain Original Scent burning in my kitchen right now! Olay Body Rituals Collection: This bodycare collection includes products in three fragrances based on exotic locales around the world. You can find moisturizing body wash, cleansing body wash, massaging body bar, and body lotion in Luscious Embrace, Silk Whimsy and Purely Pristine. COVERGIRL LashBlast Clump Crusher Mascara: Get lots of volume without the clumps with this curved brush that fits to the shape of your eyes. It gives your lashes 200% more volume. My mom doesn’t leave the house without her mascara so I know she could definitely use this product. COVERGIRL LipPerfection Jumbo Gloss Balm: Get colour and keep lips moisturized. This lip balm is made with both shea and mango butters and comes in 16 different shades. COVERGIRL Outlast Stay Brilliant Nail Gloss: It has a chip resistant top coat so the polish so your pretty nail colour will last longer. I don’t normally wear nail polish because it chips off then looks bad. I’m interested in putting this product to the test! It comes in 27 different shades. I would most like to try the Clariol hair color, I’m in desperate need of a new do!! would love to try the olay massaging bar soap. I’d love to try the COVERGIRL LashBlast Clump Crusher Mascara. The Freebreze candle looks great! The pantene overnight miracle. My hair could use a miracle, haha. cG clump crusher mascara i would love to try! would love to win….great prize. Chia Pet Hair – undoubtedly the Pantene repair and protect shampoo ! I love Patene, so I would like to try the Repair & Protect shampoo and conditioner. I would like to use the Febreeze candle. i’d love to win the Pantene Overnight Miracle Repair Serum, my hair needs some love. I’m getting closer to dyeing my hair to hide grey. Natural Instincts by Clairol seems like a good way to start experimenting with colour without permanent results. The Pantene Overnight Miracle Repair Serum. 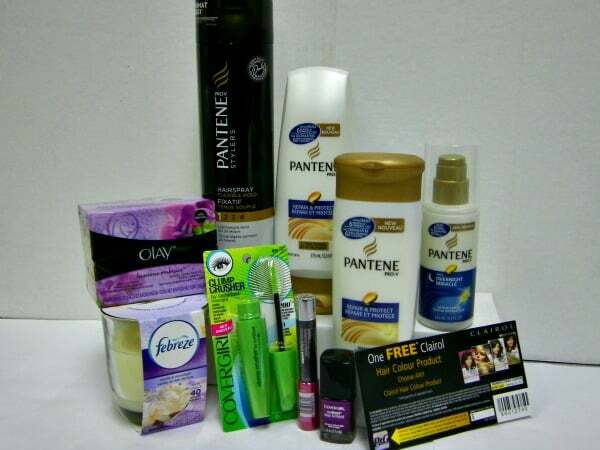 The Pantene over-night miracle.Thanks so much.I would love to win any of it. 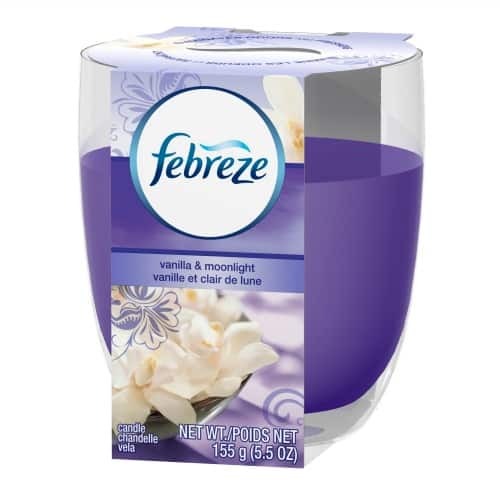 the Febreze Vanilla & Moonlight Candle sounds like it would smell amazing! I’d like to try the Febreze candle. I would love to have the candle. The Pantene Stylers Hairspray Flexible Hold. I don’t like stiff feeling hairspray. I just want it to lightly hold and help control all the static! I would love to try the Pantene Overnight Miracle Repair Serum. I would most like to try the Pantene Overnight Miracle Repair Serum. I’d like to try the Clairol Hair Colour, I colour my hair constantly so it’s always fun to try out a different product.